This has been my kitchen sink for the past 10 days. 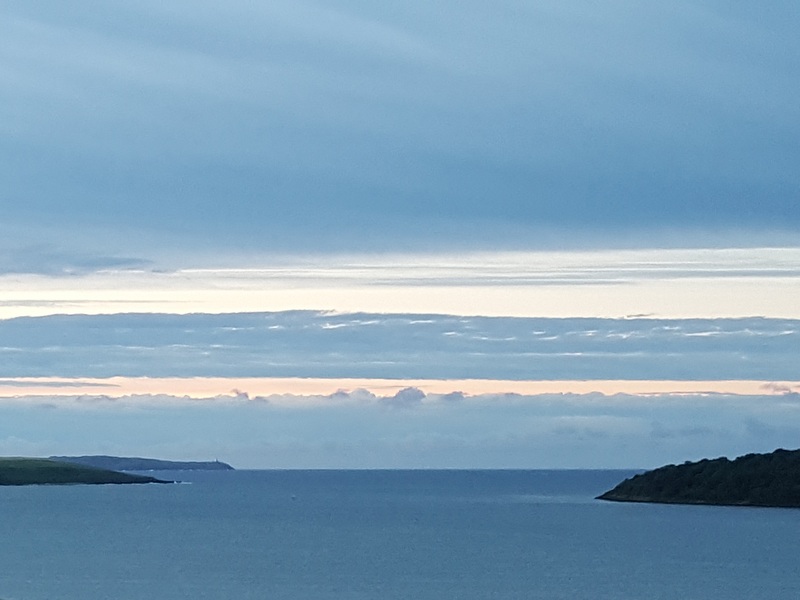 The view actually belongs to an old friend, Andy, a man with a sense of humour I have always treasured. When I once got the push from a job, he gave me a clock as a leaving present. Inscribed on the back was ‘tempus fuckit’. Recently, quite out of the blue, he offered me the chance to stay in his house in west Cork, in case I wanted ‘a change of cooker’. I said yes for three of us without checking how many bedrooms it had or even the full address. Last time I saw it was soon after he bought it 20-odd years ago; it was tiny and quite basic. 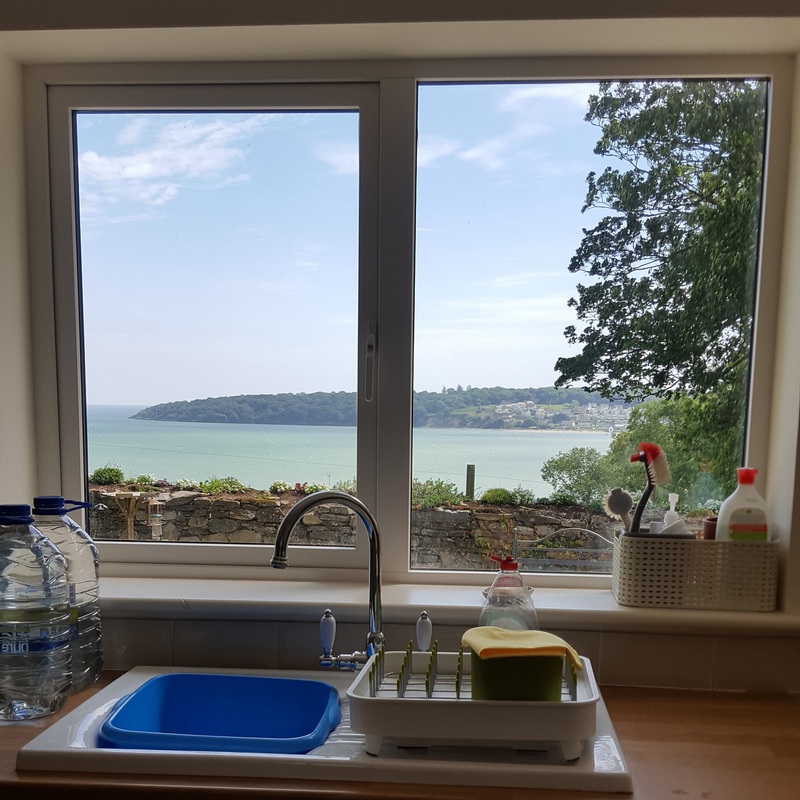 Now it’s a beautiful, light-filled home with a roomy new kitchen and stunning views over the bay. 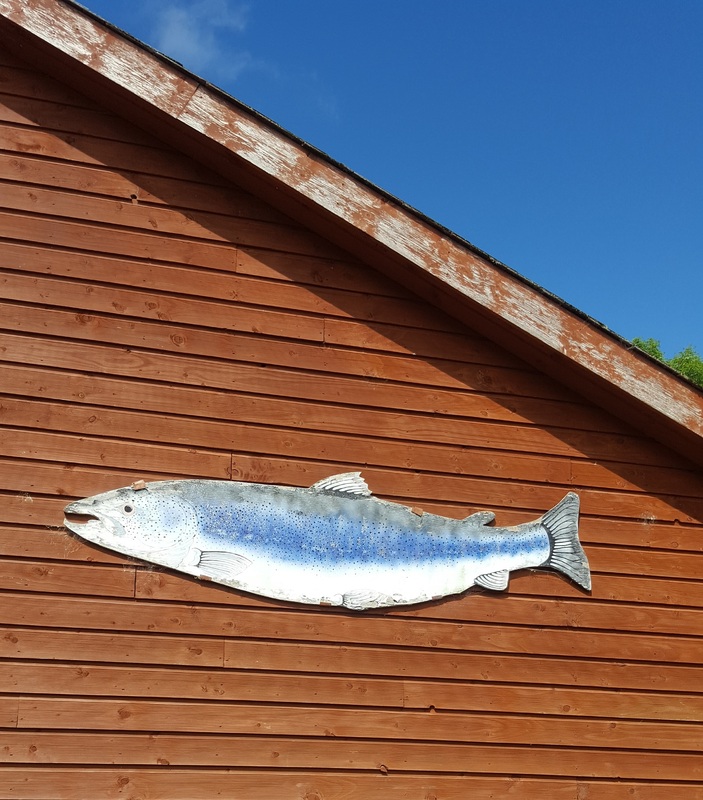 Andy is a keen angler and though he often returns the fish to the river (‘you can eat them once but catch them several times’) he sometimes takes salmon to his friend Anthony Creswell at the nearby Ummera smokehouse. The perfect host, even in absentia (he’s working abroad), Andy gave me an introduction. Anthony gave us a tour of Ummera, which sits in the woods not far from Timoleague. 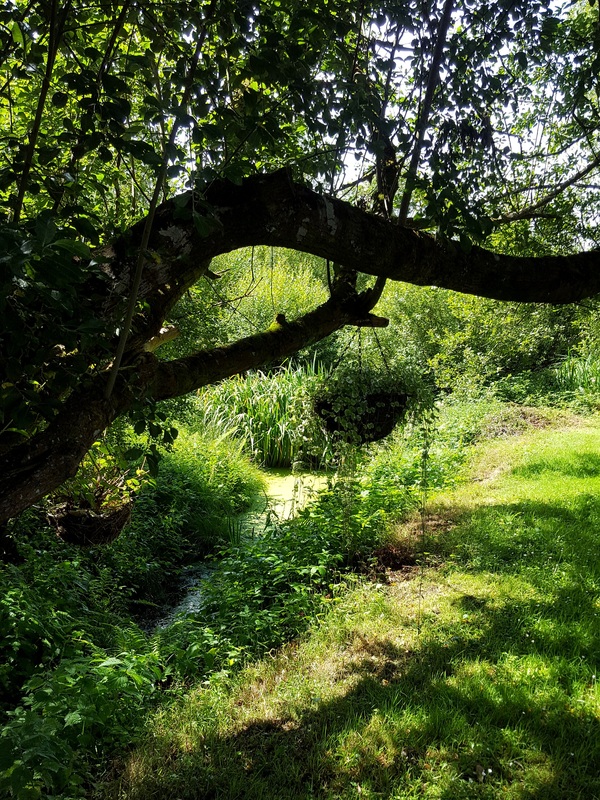 The environmentally-friendly smokehouse uses reed bed filtration ponds, pictured left, and vermicomposting to recycle its wastes. Anthony smokes organic salmon, as well as duck, chicken, bacon, beef and even water (he says it’s rather good in a glass of whiskey). Ummera has won numerous awards for its products and I filled the car with just about everything except the water. There was barely room in the fridge for my husband’s gin and we dined in splendour for the rest of the week. We were on holiday though and I didn’t want to spend hours in the kitchen, however splendid the view, when I could be sitting on the terrace drinking down wine and drinking in the play of light on the water. Anthony’s thinly-sliced and delicately smoked bacon was perfect for wrapping around a piece of monkfish, but more of that in another post. 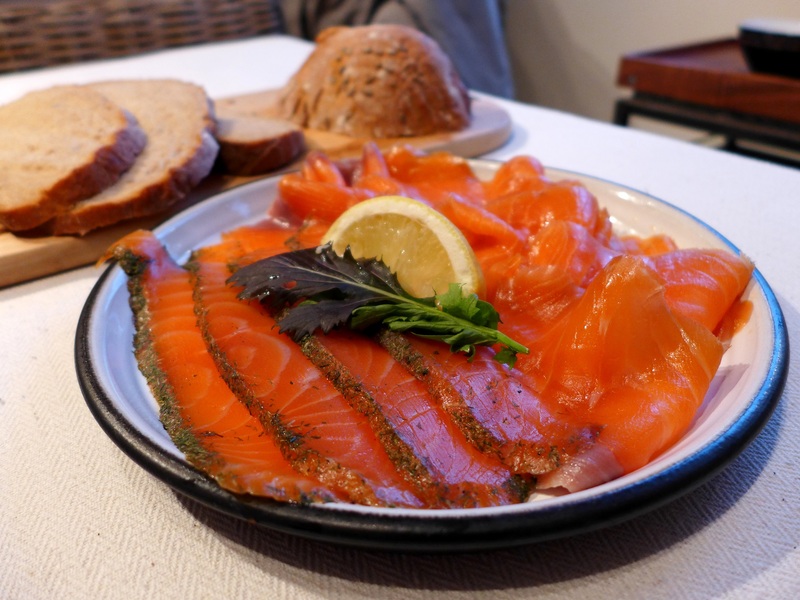 His smoked salmon and gravadlax provided an easy and delicious supper with a loaf of freshly-baked wheaten bread. What I’d like to talk about here though is Anthony’s smoked chicken. It is, aptly for such princely food, crowned, ie it’s presented with the legs and wings removed but the breasts still on the body of the bird. It’s good as it is, perhaps in a salad with fennel shavings and a lemony dressing, though it would be perfect for a creamy pasta sauce or pie filling or added to a couscous … there are lots of possibilities. I made a chunky chowder, adding some of Ummera’s bacon. Anthony, thanks for your smoking skills. Andy, thanks for everything. Heat a largish pan (big enough to hold the finished soup) and cook the diced bacon until the fat runs and it’s beginning to crisp. Scoop out and set aside. Add a tablespoon of olive oil if necessary and gently fry the spring onions until soft, about five minutes. Pour in the chicken stock and add the diced potato. Simmer until the potato is cooked and soft then whizz with a stick blender until the potato has vanished into the soup. Add the bacon back into the pan along with the chicken and sweetcorn and simmer until everything is hot. Stir in the chopped parsley and the cream. Season with freshly ground black pepper and taste … you’re unlikely to need salt. This entry was posted in Chicken and other poultry, Mains, Soups, starters and canapes and tagged Burren Lodge, couscous with smoked chicken, Irish food, smoked chicken and sweetcorn chowder, Timoleague, Ummera smokehouse, west Cork by Linda Duffin. Bookmark the permalink. Mmm. Sounds delicious. As does your holiday. Have been following your holiday photos with some envy. It really did look beautiful. Ireland is definitely on my must-see list as I’ve only ever been to Dublin, very briefly, a long time ago. 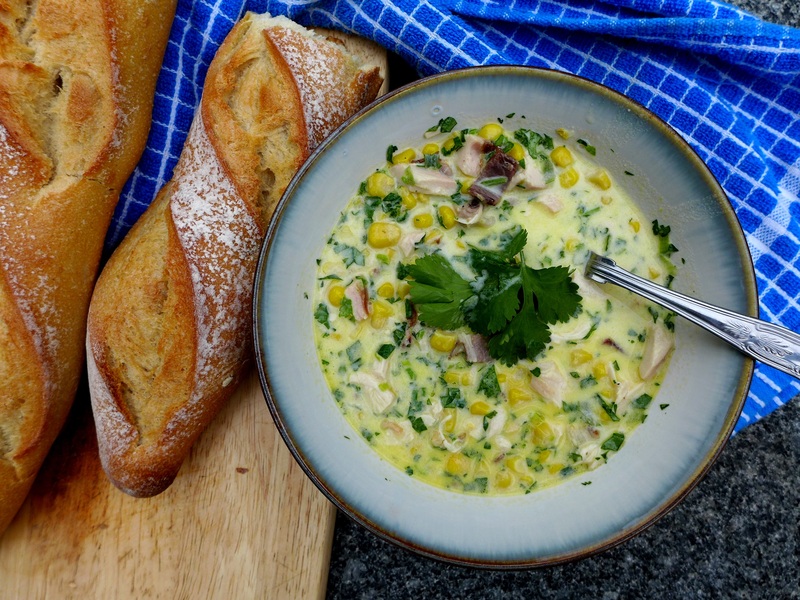 Smoked chicken sounds delicious, as does this chowder. Ireland is on my bucket list also , I have never been and I have never heard of smoked water. We were on holiday in that area a couple of years ago and I remember that we ate very well. The views from that lovely house are amazing. We drove some of the ‘Wild Atlantic Way’ and were forever stopping the car to admire the scenery. The chowder looks and sounds fab. Oh, but Dublin is a great city, you’ll have a fabulous time. I’m out of date on good restaurants etc but I’m sure there’s loads of stuff online. Have a great trip!